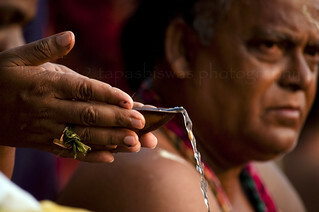 Tarpan literally means offering of water to the deceased. It is customary to add milk, oats,rice,sesame seeds, sandalwood and flowers when offering tarpan. The mixture is offered in a small stream made with the use of kusha and offered while chanting mantras. When this offering is made with devotion, gratitude, goodwill, love and good wishes, it immediately ensures contentment for the deceased. This offering is made on the death anniversary of the deceased. If one does not know the date of the death, then the ceremony can be performed during the dark fortnight of Ashvin. In the Manusmriti Tarpan has been described as pitra-yagya - a yagya dedicated to the memory of forefathers.It is believed that it gives contentment to the deceased, and promotes comfort and happiness for successors. The ceremony is meant to remember the deceased, offer reverence and appease the hunger for remembrance. Forefathers look forward to this by their successors. Among shraddh ceremonies, six kinds of tarpan are commended. Each has its own significance. Dev-tarpan aims at making an offering to water, air, Surya, Agni, Moon, energy and the gods that work selflessly for the welfare of mankind. Rishi-tarpan aims at making an offering to Narad, Charak, Vyas, Ddhichi, Sushrut, Vashistha, Yagvalkya, Vishwamitra, Atri, Katyayan, Panini and other rishis. Divyamanav-tarpan aims at making an offering to all who have made sacrifices for the welfare of mankind such as the Pandavas, Maharana Pratap, Raja HarishChandra, Janak, shivi, Shivaji, Bhamashah, Gokhale, Tilak and other important people. Divyapitra-tarpan aims at making an offering to those forefathers who left behind great moral values and wealth for successors. Yam-tarpan aims at making an offering to remember the God of Death (Yamraj), and to accept the principle of birth and death. Manushyapitra-tarpan aims at making an offeing to all those who are related to the family as relatives, teachers, friends and others.